Many drinks call for lemon juice, but there are a variety of options, from several types of actual fruits to several bottled varieties. While we have alternately used many of the available options, we have never done a side-by-side test. Can tasters tell the difference between a real lemon and ReaLemon in a cocktail? While I do not expect tasters to be able to necessarily identify which product is which, I do expect a preference for one over the other. 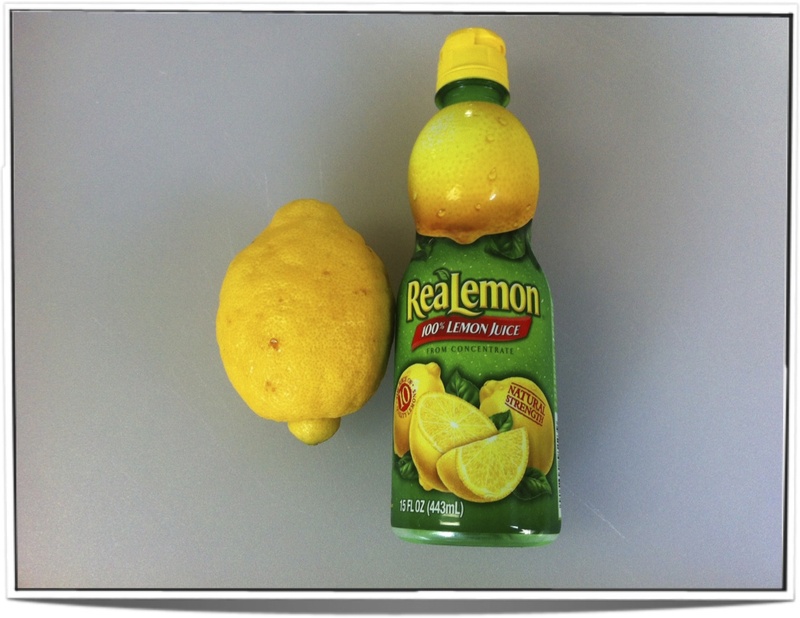 A real lemon (C. × limon) and a bottle of ReaLemon. select a lemon at the grocery store: I try to pick ones that smell lemony (surprisingly, many don’t), though, common advice is to look for fruits that are heavy for their size, firm, bright yellow, and preferable smooth & thin skinned. 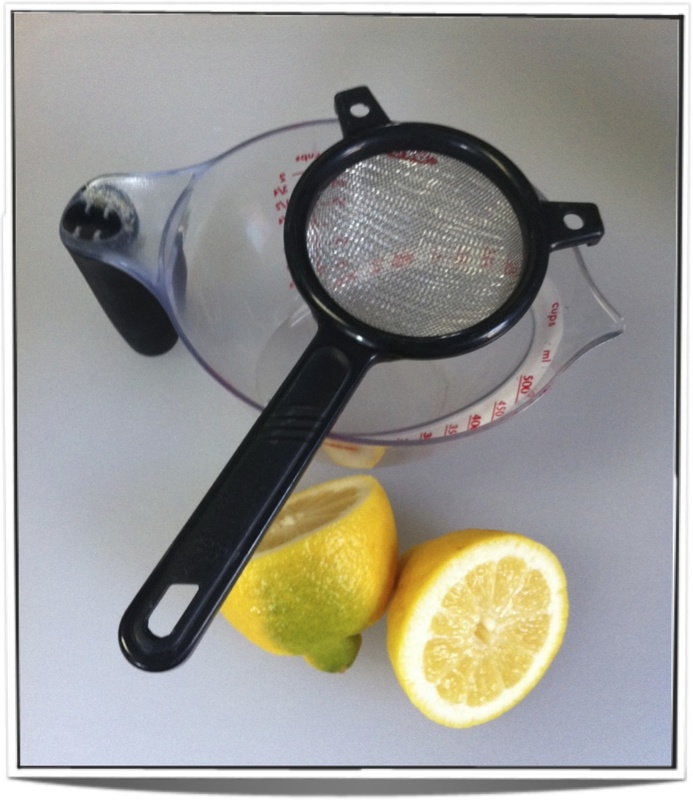 The lemon juicing rig. The strainer is to catch and seeds or errant clumps of pulp. Glass #1: Smells of Cointeau, citrusy with a bit of alcohol. Sweet on nose, slightly sour & tangier. Bright. Preferable to glass #2. Glass #2: Smells of lemon, but more alcohol-y. Round and smooth mouth feel and flavor. Smells different than glass #1 in a funky way, but nice drink & flavors seem balanced. The ReaLemon has a distinct odor, which was detectable in the final drink. Also, learned that lemons are botanically berries (technically hesperidiums). Both were nice drinks in that they seemed well balanced. In comparison however, the real lemon was definitely a clear winner, and everyone correctly identified which glass was which. Living in a northern clime, lemons are of hit-or-miss quality, and are somewhat expensive. In the case of this experiment, the purchased lemon was $0.79, and produced enough juice for 1 drink. The 15 oz bottle of ReaLemon was $2.25, which comes out to $0.15 per drink. While the resulting beverage using the fresh lemon was a clear winner, if on a budget or cocktailing for a crowd, a bottled variety might be justified. How does a real lemon compare against a Meyer Lemon (technically a cross between a lemon and a mandarin orange) or against other bottled brands? If stuck needing to use bottled lemon juice, which brand is better? If we can find different lemon varietals, is there a difference between them (do you even get a choice of lemons outside the lemon belts)?